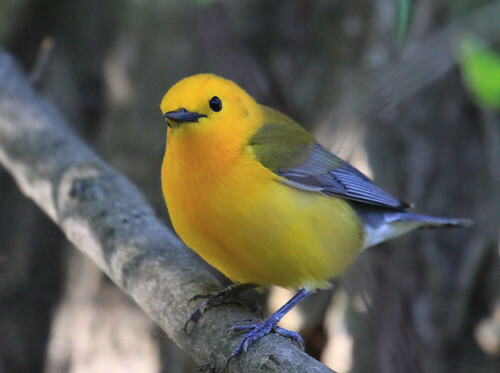 Prothonotary Warblers are the only species of eastern warbler that nests inside tree cavities and other hidden spaces. They use nest boxes, and also cavities excavated by Downy Woodpeckers, and the cavities left in trees after limbs fall. When we take the time to watch them, we can see them inspecting all kinds of crevices and dark holes. I’m sure their beautifully large eyes make exploring these dark places easier.